Wow, was that a fun few days or what?! It's time to announce our winners! Our new format is designed to bring you MORE! 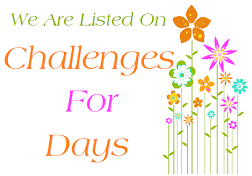 Always love your challenges, and more time is ideal for us still working crafters...Change is exciting. Look forward to the great new designers, too. enjoyed your answers with pictures. Looking forward to your creations. Great questions and cool answers too - am going to have to youtube some of these recommended songs! Congratulations on your CAS-ual Fridays DT slot - ENJOY! Congratulations Sylvia on the DT assignment renewal! I am looking forward to this new format and seeing all that the team will inspire us with. Have a wonderful day! Congrats on your CAS-ual Friday DT post! I'm looking forward to your projects. Have fun! Your right, its very hard to pick just one! Will go with RAD - love the stamps and the cards have fantastic designs. Was great going to the blogs and meeting these 3 wonderful women, looking forward to the next 3! This is all so exciting! You assembled an awesome team and I can't wait to see their creations! The New Challenge Will Begin!!!! Wahoo! I am one of the winners! It was a super fun revealing party, Michelle! Thank You! Can't wait for the new challenge with new team tomorrow! Thanks for such a warm welcome ladies! Congrats all winners! Enjoy your prize! It totally made my day to see my name among the winners! Thank you so much! Can't wait for the new challenge tomorrow and to see what the new team has created! SQUUUEEEEAL! So excited my name was drawn. Congrats to the other winners! I can't believe I am one of the winners, yippee!! Am so very excited as I don't have many stamps or dies so these will be warmly welcomed into my collection. Thank you so much!! Wow, what a fun surprise to see my name as one of the winners. Thank you so much!